The brother knights commenced the prep work a couple of days earlier in purchasing the burgers, sausages, buns, condiments ,pop, water and other essential items required to make the BBQ hugely successful. On Sunday morning, the brother knights along with PGK Gabriel Ogundele and PGK Fred Gamboa event Chair/Co-Chair commenced the preparation of the burgers and sausages and set up the music system along with some tables and chairs to enjoy the beautiful outdoor weather. Our grateful thanks to the PGKs Gabriel and Fred, Chair and Co-Chair, IPGK Joseph and to our community of brother knights who formed part of the BBQ Team, working with dedication, zeal and camaraderie. The Squires Executive & the Counsellors also provided good support to the brother knights throughout the morning by promoting the event to the parishioners and then assisting with the BBQ. Well done to all of the brother knights who generously volunteered their precious time in the preparation of the tickets, posters, sale of tickets during Masses, set-up of the BBQ area, purchase of items, preparing the BBQ, manning the cash station and cleaning-up after the event. 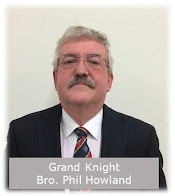 I am pleased to re-introduce you to a volunteer choir group of brother knights and spouses of brother knights from our Council and other non-council members, who form part of the overall group. This group has been in existence for several years but has kept a low profile with the good work that they do and enjoy. This talented group of singers and musicians bring joy to the residents and seniors at the Carmel Heights and Mississauga Extendicare on a monthly basis. 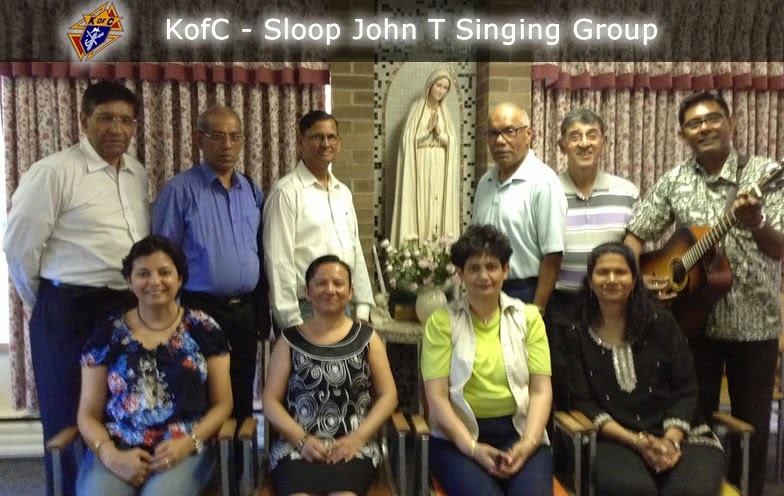 I am pleased to append the names of the choir group members below. 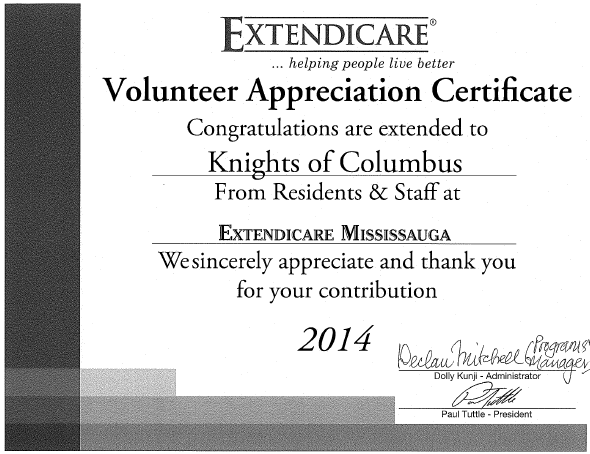 They were recently awarded a certificate of appreciation by Mississauga Extendicare. Please join me in congratulating the choir group for their valuable support to our Mississauga community.